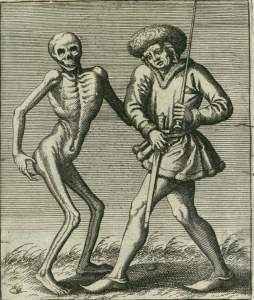 Hess: Death, who fetches the nobleman has been provided with a fantastic moustache. The judgment-scene above the entrance to the ossuary has been replaced by the words "Memento Mori". Hieronymus Hess (1799-1850) was an artist from Basel. As a young man he studied a few years in Rome among the contemporary artists known as "Nazarenes". Another Nazarene was the Danish sculptor Bertel Thorvaldsen and Thorvaldsen's Museum's Internet-site has a number of letters from Hess to Thorvaldsen. 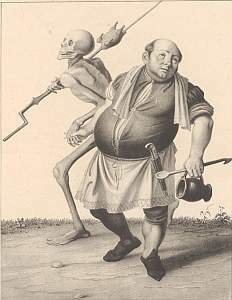 Later on, Thorvaldsen through his contacts sent the young Hess to Nuremberg, but Hess preferred caricatures to Dürer. 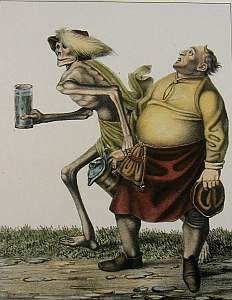 In 1839 Hess was commissioned by Gottlieb Hasler to copy the watercolours that Büchel had made of the dance of death in Basel. The wall with the mural had been demolished in 1805, which might be the reason why Hess could allow himself great artistic license. The painter and his wife had already disappeared from the mural when Büchel made his watercolours. Hess also skipped the introduction with the preacher and the epilogue with Adam and Eve along with the heathen and the heathen woman. 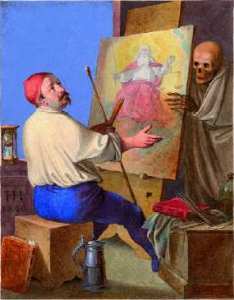 On the other hand Hess added four extra pictures, one of which represented himself. 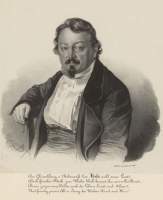 The 40 lithographs are accompanied by a trilingual text, which is a different one than the one accompanying Chovin's, Beck's and Stuckert / Schneider's publications. I have placed this translations under each dancer. 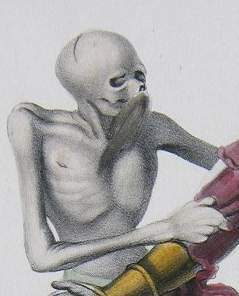 The original mural included a "Blutvogt", who was taken by Death like everybody else. Hess instead has a "Scharfrichter". 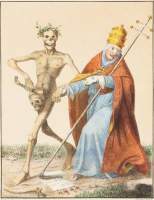 Death stands close to the executioner with his scythe. The two tools of the two murderers. Another change was the executioner. 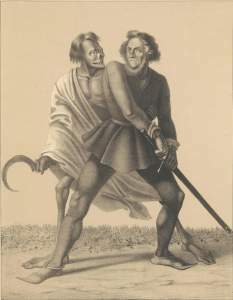 While there was a "Blutvogt" in the original dance, Hess replaced him with a "Scharfrichter" and a totally different illustration (pictures to the left and right). Hess added a Chinese to the dance. The cook was chef cuisinier Barrey. Another addition was the Chinese. 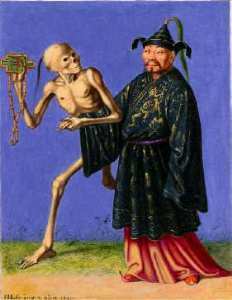 This is quite an unusual participant in a German-language dance of death, but the explanation is that the First Opium War started in 1839 — the same year Hess started his work. 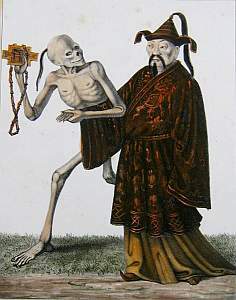 The Chinese laments, »Mein Opium und sein Begeistern Bringt mir den Tod mich zu bemeistern«. The allusion to the Opium War is even clearer in the English text: »My opium, it is inspiring, But brings me death by English firing«. 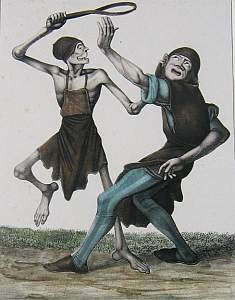 Hess' background as caricature artist showed in his work: The participants in the dance had their physiognomy and faces modeled after well-known citizens of Basel. For instance the cook bears the likeness of Monsieur Barrey, the chef cuisinier of Gasthof zum storchen / Hôtel de la Cigogne. The various editions are without year, and there is no preface or other information inside the books. The title repeats the age-old error that Holbein should have created the dance in Basel: »La Danse des Morts à Basle de Jn. Holbein / Basler-Todtentanz von Hans Holbein«. The 40 lithographs are all signed »Hess pinxt« and »Danzer Lithog.«. 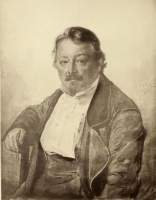 After the publication by Hasler in 1841, the lithographs were bought by Albert Sattler, and in 1845 they were transferred to Frédéric Wentzel in Weissenburg in Alsace. 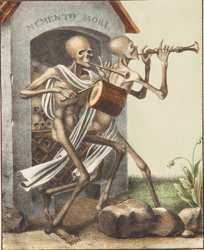 They also have an 1846-edition: La danse des morts à Bâle. Some of the editions were trilingual. The English text from the 1841-edition has been transcribed and placed under each dancer, e.g. : The pope.